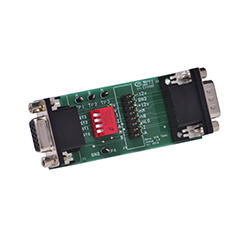 The 018-BRK1 test board is available to assist in making test connection to the Deva 018-1SIN interpolator. Order code 018-BRK1. It is inserted in the cable after the 018-1SIN and derives power from the Deva001, Deva004 or Deva037 in use. Switching the switch TEST0 into the closed / down position will invoke test mode the next time the 018-1SIN power is cycled. When in test mode the signals described above will be present on both the A,B test loops and the J3 header. Use the GND test point for the oscilloscope ground clip. The nA and nB phases if required can be found on J3.